“It wasn’t that bad.” That’s what Danny Jacobs said Saturday night, about Gennady Golovkin’s fearsome, world-ending, thunderous power. It may be true that compared to cancer, it wasn’t that bad. Danny Jacobs is the second-best middleweight in the world. He’s strong, a knockout puncher, he has solid boxing skills, he’s been tested in the amateurs and the pros, and, famously, he survived bone cancer and returned to championship-level boxing. You also could hardly find anyone who thought he wasn’t going to get knocked out on Saturday night. The press row experts were giving him three to six rounds. The trainers at the gym in Brooklyn would say publicly that Danny could take it—he’s a Brooklyn fighter, after all—but if you sat down and started talking to them they’d allow that they didn’t really believe that anyone on earth, Brownsville cancer survivor or not, could take Golovkin’s punches and remain upright. On June 21, 2008, journeyman Amar Amari lost an eight-round decision to Gennady Golovkin. Since then, 23 men in a row have failed to finish a fight with Golovkin. Ten were knocked out; eleven were beaten so badly that the ref stopped the fight; and two quit in their corners between rounds. Included in that group are many of the top fighters in the division. Golovkin has been knocking the hell out of everyone in the world for so long with such ease that many of us had come to believe that his iron hands would punch through any human flesh, that his adamantium skeleton could not be nicked. Danny Jacobs is the best 160 pound fighter in the world, next to Golovkin. Would it even matter? On Saturday night, Danny Jacobs lost. He lost fair and square. But he lost by decision. He lasted 12 full rounds with the scariest man in boxing. He only got knocked down once. He survived, and more than that, he made it a legitimate contest, whereas almost all of Golovkin’s previous opponents were merely the stunt men who went flying when the hero cracked them and kept on striding by. Devastating punchers are not all that rare in boxing. At any given time, in any given weight class, there are at least a few fighters who are capable of wiping out anyone’s consciousness with a single shot. Some are speedy and explosive, and some are brawlers, and some like hooks and some like right hands, but pure power is a routine feature of world class boxing. Golovkin has devastating power, and so is sometimes thought of as “just” a power puncher. This is not true, in the same way that an attack helicopter is not just a gun. Golovkin combines his power with perfect balance and deceptively good defense, accomplished always with the least amount of movement necessary, and with a stalking, relentless form of pressure leavened by just the right amount of patience. Some pressure fighters rush in and put their body on you and struggle to smother you, chasing you wherever you go, seeking to panic you and cause you to tire out before they do. That sort of frantic pressure is not Golovkin’s style. He advances deliberately behind a hard jab, a jab not used for measuring distance but for breaking eye sockets. He crouches and stays low and jabs and comes forward behind a high guard and looks always for the opening to land a huge right hand or an equally huge perpendicular-to-the-floor left hook that will end everything. Most of all, he cuts the ring, always—meaning that as he advances towards you, he simultaneously cuts off your avenue for escape. Anyone whose strategy is to stay away from Golovkin and keep their distance comes to find themselves boxed into an ever smaller area, until they are against the ropes, and that is when they meet their end. There are only two textbook strategies to use against a pressure fighter: You either give in and meet them head on, leaning on one another and pounding away until one of you drops; or, you constantly retreat, jabbing and trying to hit them as they come towards you before you move away again. The first method is impractical against Golovkin—no one on earth can win a punch for punch battle with him. That leaves the second method. For at least 23 consecutive fights, no one has successfully managed to stay away from Golovkin. Some do it for a round or two, but he has that intelligent pressure that closes out all available space and inevitably leads his opponent into a place from which there is no escape. But Danny Jacobs did it. He moved sideways. He watched, he jabbed, he moved laterally, and he avoided the fate that has befallen so many others. There’s a little more to it than that, of course. He has power that even Golovkin was forced to respect, meaning the pressure could not come quite so fearlessly. And, most remarkable of all, he took some of Golovkin’s shots. Danny Jacobs was hit flush with power shots several times in this fight, and he only fell down once. That is more than almost anyone else can say. (Gabriel Rosado weathered a lot of punches from Golovkin and stayed on his feet, but after seven rounds he was drowning in so much blood that his corner cut the fight short.) 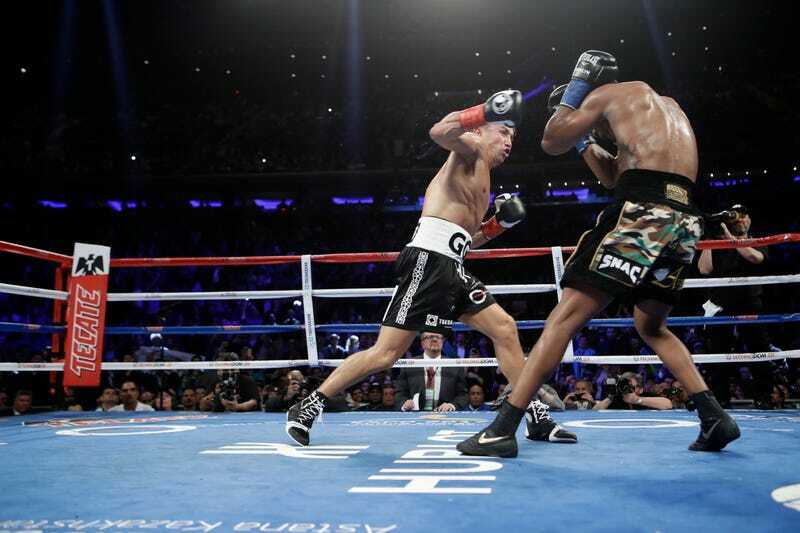 Even if someone else can successfully use left and right movement and hard jabs and flurry with enough power to keep GGG careful, taking those punches is the part of Jacobs’ strategy that may be hard to replicate. Danny Jacobs did not win. But he proved that it is possible to fight Iron Man without being fully destroyed. He proved that it is possible to survive Golovkin. Now, someone has to prove that it is possible to hurt Golovkin. Then someone has to prove it is possible to beat Golovkin. We are still at least two full steps away from being able to make the claim that Golovkin is not invincible. The rest of the world should not be seduced into fantasies of toppling the apex predator just yet. Evolution always leaves a trail of bodies in its wake.